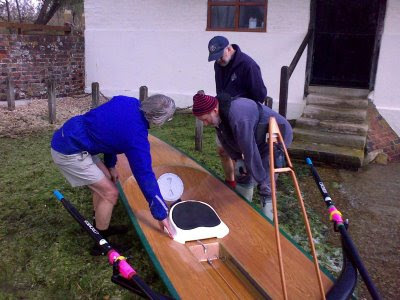 Paul Zink brought the prototype Clovelly Scull to Langstone today, on high spring and a stiffish southerly breeze bringing up white horses in the harbour. Last time I tried the Clovelly Scull on the Hamble, the water was mirror-smooth, so it was interesting to experience how stable she feels in a chop. The wind also highlighted how useful the retractable skeg is. When it is fully retracted, the boat broaches to quite forcefully, but dropping it by releasing the conveniently-placed rope brings the boat back on track instantly. The picture shows how difficult it is to photograph an interesting boat without getting a screen full of behinds.